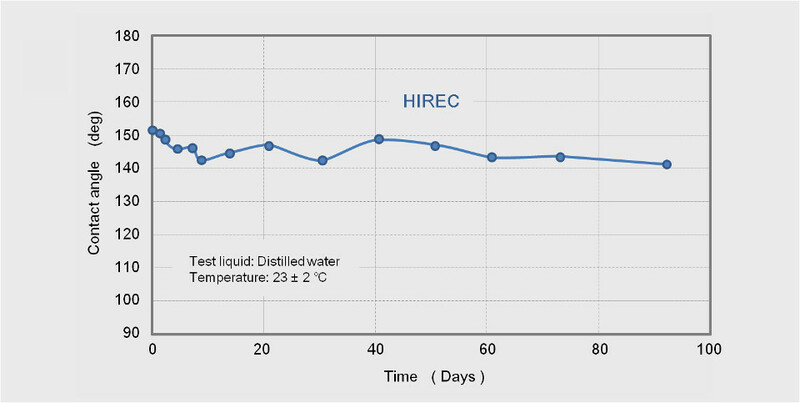 The stability of HIREC water repellency was measured by water immersion test. 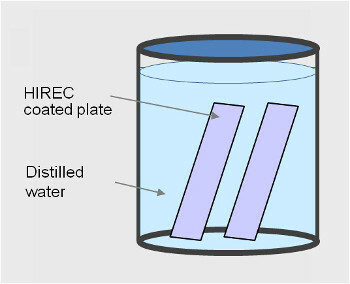 HIREC coated aluminum plates were plunged into water 3 months and the change in contact angle was measured. The contact angle of HIREC after 3 months water immersion was greater than 140 ° and showed durable water repellency. The specimens were fully immersed in pure water having adequate amount. After specified test time the specimens were taken from the test water. Then contact angle of the specimens were measured. Put the specimens back into the test water to continue the test. HIREC shows no abnormality during 92 days or 3 month water immersion. Contact angle during and after 3 month water immersion was greater than 140°. The contact angle was stable during the water immersion test. HIREC maintains highly durable water resistance in 3 months water immersion test.